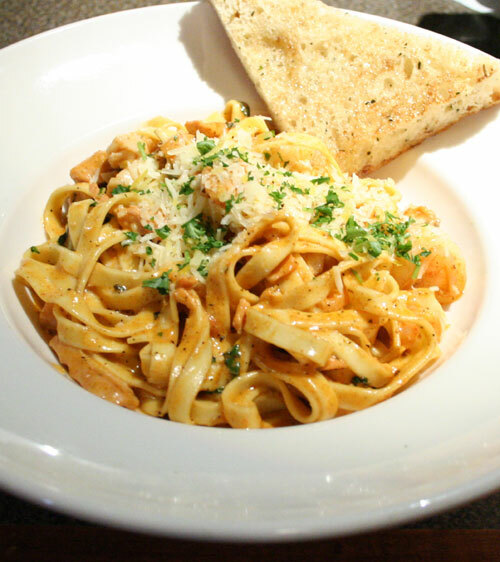 Milestones is a popular chain of trendy restaurants in the Vancouver area. The Yaletown location (1109 Hamilton Street, 604-684-9111) offers casual dining in a hip atmosphere. I ordered the Seafood Fettucini, which was $16.99 plus tax. Made with Cajun spices, the pasta was very tasty. 17,323 views. This entry was posted on Monday, June 18th, 2007 at 7:51 pm	and is filed under Casual, Downtown, Food Photos, Large Groups, Pasta, Restaurant, Trendy, Vancouver, Yaletown. You can follow any responses to this entry through the RSS 2.0 feed. You can leave a response, or trackback from your own site.